Amani FM was established in Tana River County, Eastern Kenya, in the weeks prior to the 2017 August general elections. The key objective of this initiative was promoting peace and tolerance throughout the elections in a region historically known to have deeply divided rivalry. In the 2012-2013 election period inter-communal violence led to the loss of lives, destruction of property and the internal displacement of thousands of people. Amani is the Swahili word for peace and the concept behind the radio station was inspired by the need to give a voice to the local community, encouraging an open dialogue and an attitude of peace among the communities in the process. Prior to the August general election, Amani FM invited Steven Karani, the district returning officer of Tana Delta, to the studio so that he could educate community members on the voting process and requirements for one to vote. The studio then opened the phone lines for listeners to call in and ask questions about the election. Amani FM made a courtesy call to the office of the deputy county commissioner (DCC), who is in charge of security in Tana Delta District, and sharing with him together with other top security government officials the idea of using Una Hakika and Amani FM to assist in bridging the local information gap that had contributed to the outbreak of mass killings in connection with previous elections. During this meeting, Amani FM requested permission from the security team to allow news anchors to move freely at night to keep the radio station operating despite a recently-imposed curfew due to al-Shabaab attacks in nearby Lamu. This request was granted and Amani FM broadcasted continuously leading up to the election in order to inform listeners about the election process and situation updates. 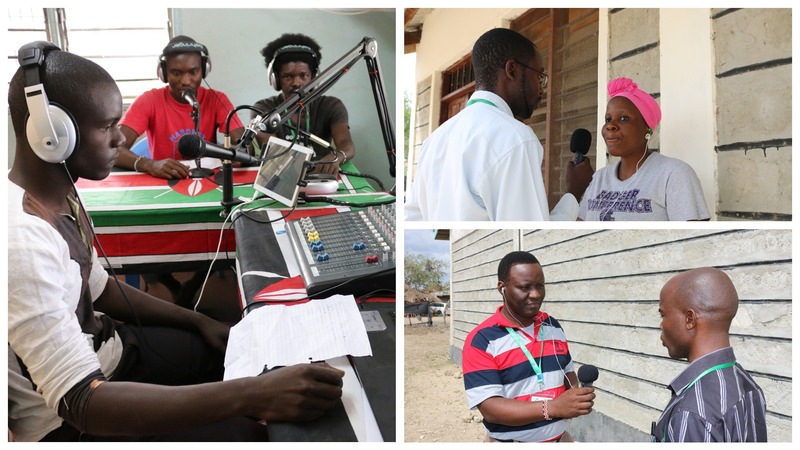 Amani FM volunteer news anchors have carried out a variety of outreach events in the surrounding communities, recording peace messages from religious leaders, village elders, political aspirants, and community members. These messages are played after every broadcast session. The day before the elections, Amani FM team conducted a roadshow, moving around the Tana Delta villages as community volunteers from different ethnic and religious backgrounds preached peace at every stop as a sign of solidarity. These visits offered the chance to encourage community members to subscribe to the Una Hakika system in order to receive accurate rumour verification services and also served as an example that young people can walk together in the call for peace regardless of their ethnicity. Audience members were urged to stay at home after voting to wait for final announcements from the Independent Electoral and Boundaries Commission (IEBC), which would broadcast live from the National Tallying Centre. This visit was a timely success since the campaigning period for the aspirants for different positions had expired, leaving more attention from a large audience for the Amani FM and Una Hakika teams. On Election Day itself, Amani FM ran a 24-hour live broadcast with anchors at various polling stations and tallying centres, ensuring that we covered results coming in from the National Tallying Centre through the online portal operated by the IEBC. This helped community members to know what was happening with the election without needing to hang around the polling stations or having to speculate on the results. After polling stations closed many rumours circulated, especially after the incumbent sensed defeat. Communities were tense over possible outcomes in the event that their preferred candidates lost. Some individuals went as far as spreading false information in order to cause a rift that would lead to conflict, as has happened all too often in the past. At every step of the way through the tense election, Amani FM has worked closely with the Una Hakika system, working around the clock to verify rumours. With these rumours in mind, Amani FM broadcasted a special programme to educate communities about the dangers of relying on unverified information, providing the toll-free Una Hakika SMS service to receive accurate information in the event they hear worrying rumour mongering. This program also served as an opportunity to dispel the rumours that were already causing tension and mistrust. At points throughout the programming, community members called in live with messages of peace, extending an olive branch to other communities. When Uhuru Kenyatta was announced as the winner of the presidential election, Amani FM opened its call lines to receive reactions from community members while encouraging the winners to celebrate responsibly and losers to concede gracefully or to follow due process if they had any questions in regards to the credibility of the election. In a historic ruling on September 1, Kenya’s Supreme Court nullified the re-election of the president due to several irregularities, ordering another election to be held 26th October 2017. The stakeholders involved in conducting the next elections have thrown the country into a state of confusion. The Independent Electoral and Boundaries Commission (IEBC) on its part insists the elections will take place on the 26th October, even though the Chair has confessed inability to conduct credible elections in the current state. One of the Senior IEBC commissioners resigned few days before the August elections citing many reasons, including the fact that the commissioners are under siege. The Jubilee Party – the president’s party has used its numbers in parliament to amend election laws and insist the elections must take place whether the opposition will participate or not. The major opposition party, the National Super Alliance, plan to boycott elections and insist that if no reforms are undertaken in the IEBC then no elections will take place. Instead, they will call for mass demonstration across the whole country on the voting date. This could well be a recipe for chaos and anarchy. Amani FM and Una Hakika are not taking any chances. Fake news and rumours thrive in such environments, and we are working to contained and manage misinformation to prevent the outbreak of violence. Give feedback either targeted to a specific population or mass broadcast determined on case-by-case basis. Amani FM continues to encouraging dialogue between different tribal groups through radio programmes and community service announcements. Our team of volunteers are also engaged in off air activities like networking headmen of different villages through meetings. These headmen have agreed to intervene as a group in situations in which there is potential threat to peace. Our hope is that we will be able to attain sustainable peace through the proactive efforts of community radio and Una Hakika. This particular approach can be a model that other media practitioners can adopt to address fake news, rumours, and hate speech, especially in conflict prone areas.